← Huff Po continues with fallacious characterizations and misleading statements. Today, we are told that we don’t need more electricity and fuel, but rather we need to become more efficient with the electricity and fuel that we already have. Most everyone I know tends to agree with the necessity of becoming more efficient. Being a person directly involved in “smart grid” technology. 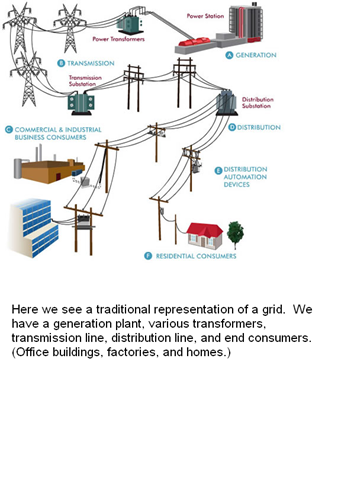 I’d like to give you an honest, yet simplified, view of what a traditional electric grid looks like. This is a proven system. It works and it works well. It is scalable and adaptable to just about any geographic concern. The simplicity of the structure lends itself to efficiency. Maintenance and repair are as just as straightforward. Capacity is easily adjusted and the costs are fairly predictable. Efficiency has many definitions. Here are a few… The ratio of the effective or useful output to the total input in any system. And/or, performing or functioning in the best possible manner with the least waste of time and effort; having and using requisite knowledge, skill, and industry; competent; capable. And/or, the power or capacity to produce a desired result. Here are some synonyms to consider….. effectiveness, economy, productivity, organization, efficacy, cost-effectiveness, orderliness. Some antonyms to efficiency………. helplessness, impotence, inability, incompetence, ineffectiveness, inefficiency, weakness. Ok, we all got that, right? Now, here is a simplified alarmist vision of a more efficient grid. Ladies and gentlemen, this isn’t some futuristic goal of the way things could be. We are working towards this today. And this is what we’re going to saddle future generations with unless we change the goal and change it soon. Consider the inherent complexity to such a system, the logistical nightmare, the cost of the infrastructure, the potential fail points, the materials and energy spent simply for constructing such a monstrosity, and the myriad of other issues I haven’t even spoke about. And all of this because we won’t dig more coal, construct more nuclear plants, and are tearing down our hydro plants. Gee, I wonder why our economy can’t rebound? 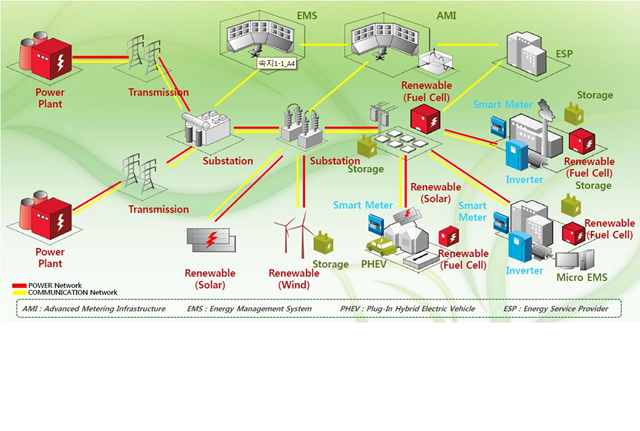 As I’ve stated, I’m directly involved in implementing smart grid technology. I’d be happy to answer any questions posed. This entry was posted in Climate, Economics, Energy. Bookmark the permalink. I noticed that the simplified Alarmist version of the grid took up so much real estate for all the wind mills, solar stations, storage systems, and control centers that the poor residential consumer had to give up their home and be removed from the new grid. Mr. Consumer is now living out of his PHEV because he couldn’t afford the electric bill and carbon indulgences needed to turn on the lights in his former home. But that was only the beginning of Mr. Consumer’s woes with the new grid. He lost his property (couldn’t sell it) because he couldn’t afford to upgrade the house to meet the EPA insulation regulations, replace his lights with LED technology, and replace all appliances with the latest EPA approved energy and water efficient versions which, by law, must replace last year’s models that no longer conform. Besides, the wind generator low frequency noise was causing his whole family migraines and the constant flashing of blades in the windows in late afternoon were triggering epileptic seizures with their youngest son. Cleaning the bird and bat entrails off the windows and front porch was a constant chore so the old home wasn’t really missed all that much. More, on our poor consumers’ woes……. they couldn’t afford the upgrades because the factory where he worked shut down and moved to a country without the expense and regulatory energy deprivation. So now our consumer is jobless, penniless, and with a cold and hungry family. Which, is the desired result of the Malthusian misanthropists we call alarmists. >Most everyone I know tends to agree with the necessity of becoming more efficient. That’s what they say but not what they promote. How can solar be “efficient” at 40 cents/kWhr? How can wind be efficient when it takes 5,000 to create the same kWhr’s as a nuclear plant, much of it at night, fluctuating, and of course we still need the nuclear plant. We live in a wacky, wacky world, where black is white and white is black. Yes, how can our economy rebound. I sit and think, knowing that stupidity seems to be a law nowadays, why do i have money in the stock market?? lol, yes, stupidity has been mandated. I get pretty angry sometimes when I consider how much money, energy, innovation, and effort has been wasted by this madness. No one in their right mind would look at the bottom pic and think this is something of worthwhile pursuit. But, that’s exactly what is advocated and is exactly what we are pursuing. Everyone wants that extra penny for doing their part. I watched this same scenario during the telecom deregulation in the70s. More middle men looking to get a share of the action and the original players seeing an opportunity to get a couple of extra bucks. Some of the groups promoting his STUFF are supposed t be watching out for the LITTLE GUY, however that is how the money gets in their pocket! The REA that provides my energy is pushing this “Stuff” and their are supposed to be a Co-op! Yes, its bizarre, but the Co-ops have led the way in the smart grid tech. I work for a small co-op. Many still don’t understand what they’ve done. Yes, somehow you need to rescale that “smart grid” to show how the real estate occupied by the wind and solar is about 1,000 times the area of the power plant. Or more. They keep saying solar is coming down in price. I saw a recent price of 35K for a 5kW system and by math I get 50cents/kwhr if the solar works for 25 yrs. Most of the calculations I’ve done for solar have come to about 40 cents/kWhr. But instead of feeding the solar fossil, we just use fossil to create it, so wallah, magic, it’s fossil free. That’s what i call smart. Wind is much cheaper. But terrible for our environment. Wait until we see the mess we left in 25 years, and of course our kids will still be paying for the electricity we use now, somehow they are supposed to appreciate us for doing that to them, footing them with our bill, because we are “smart” not to pay for it now. (like we do with traditional power sources – we pay as we go) Of course, most of “these people” don’t even understand what a subsidy is or what it means. Sorry, don’t get me started! Wind is cheaper than solar, but still more expensive than traditional hydro, nuke, coal, and gas. And, because of its unreliability, we still need the traditional plant. Worse, we still need to maintain both and the redundant infrastructure and materials for such. It’s just amazing to me that there are people that advocate this lunacy. And no, most don’t even understand the concept of subsidizing. Or, the very rare circumstances that would make subsidizing anything being appropriate. It is my sincerest hope that our grandchildren will simply laugh at us and tear the damned things down……. if there are any left standing. Often, these wind project go up and fall into disrepair because they were only built to get the payday, and the ability to claim an increase percentage of “renewable” energy. Great that you post this! There is not enough discussion on how the energy solution looks like and too many naive people talk about it without understanding. I have not seen a calculation of efficiency for energy production from wind & gas versus only gas or coal or nuclear. How much loss is added to the system through the variability of wind, solar, inefficiency – reduced efficiency for gas due to the variability of wind. In the end it is only true numbers that matter – reality bites back. Any such posting helps increasing understanding the faster the better. On thing I’ve predicted for a long time is that if electricity prices go too high there will be an amazing increase in the number of petrol generators being sold. Then the government will try to ban them. Or, more precisely ban them via taxing them into oblivion……. if this madness continues, we’ll head directly towards that scenario. But, that isn’t the real problem. There are many residential electric applications that can be supplanted by other sources of fuel. The biggest problem this presents is to economic growth. We’ve capped our electric generation capacity. So, manufacturing, which heavily relies on electricity cannot grow. Manufacturing is how the western civilization grew its wealth. Today, we’re leaving that to the far east. This is why our wealth isn’t growing. I have just looked into some energy efficiency in Australia and found that the government isn’t even serious it’s all about money wasting schemes. I went to an electrical retailer and found that the plasma tv’s used about double the energy of LCD or LED. Compare an inefficient 51 inches tv rated to use 640 kWh/ year (a 4 and half star rating) and efficient 55 inches tv which would use 350kWh/ year (a 7 star rating). The cost of the LED versus Plasma was a lot more but if you take into account the power used with Australian pricing the LED will be cheaper over time. So the difference being 290 kWh/ year Now it only takes 340 kWh/ year to run an efficient 218 liter fridge freezer (a 2 and half star rating). Now that TV could be stuck in a bar running 14 hours a day. If I am to make efforts to save money or emissions it will amount to nothing because that tv will be sold to someone (who will complain about their power bill lol) So I would much prefer they ban inefficient products that have no real extra value. With vehicles you have to drive a Prius about 500 000km to make a saving when compared to a Corolla which is of a simular size. It is nice those people can show off their money but it would actually be cheaper and more effective to convert a few Corolla s to natural gas if you are worried about CO2 emissions and money. First should always start with the basics I think. Energy costs money so use less energy or cheaper energy and save money. Our governments take a different view everything costs money lets spend money. Only after saving money should you then consider spending money. Suyts: how did you end up involved with smart grids? Yes, the U.S. has a similar useless system of rating products. As to how I fell into this, it was purely accidental. I’m a network admin by trade. The utility company I now work for had purchased a “signal over power line” application, but needed someone to make it go. And, I was tired of the software company I was working for….. it has been an eye opener. This has actually been a great experience for me. I’m working for a rural utility that my grandfather helped build. They all did back then. No electric company wanted to go through the expense of building line out to the farmers in the area. So the farmers all got together and literally built the line to themselves and neighbors. It’s come a long way. Thats good and I think you are a good person for the job, by the sound of it you will try to reduce waste.